If there was a less enviable assignment in all of the comic book industry than following Matt Fraction, David Aja and Annie Wu’s stellar run on Hawkeye I am certainly not aware of its existence; fortunately for us however there arose from the swirling mists a bold duo who proved to be more than up for the task, the creative team of Jeff Lemire and Ramon Perez. Straight away these two brave souls would be faced with the arduous chore of maintaining that unique, inventive style that came to define the former creative team’s amazing turn on the character while bringing something of their own that is entirely new to the book. Huh? Complicated right? Well that is the exactly what was expected of any souls courageous enough to take on this task. 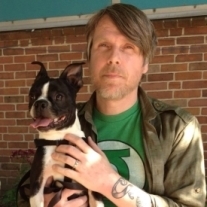 Lemire has had a successful run on another archer’s book when serving as scribe on Green Arrow while at DC, however after five years of exclusivity to the publisher, Lemire decided to not to renew his contract. In an interview with Newsarama, he explained his decision by saying, “I decided not to renew so that I could spread out a bit and try some new things.” Hawkeye is Lemire’s first foray into the House of Ideas and judging by this inaugural issue it is a perfect fit. It is immediately apparent that he not only appreciates the previous run but very cleverly continues to build on the characterizations and interactions that were founded in that undeniably brilliant creative tenure. The idiosyncratic eccentricities that came to be such a huge part of this character and this world are still very much alive in Lemire and Perez’s book albeit some of them are a bit toned down; for instance the dark humor and gritty streetwise dialogue are not as readily evident but the same blood that coursed through the veins of Fraction’s Clint Barton most assuredly courses through this Hawkeye’s as well. The difference is that this is another chapter in the Clint Barton story and almost by default, Barney Barton and Kate Bishop’s stories, because you can’t tell one without necessarily telling the others. 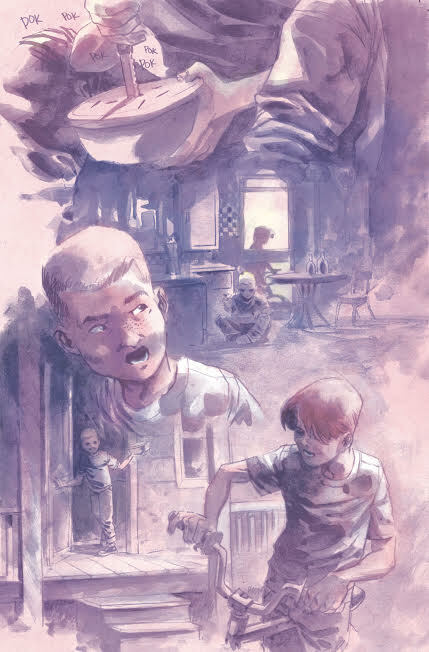 Lemire creates a far more poignant narrative largely concerned with Clint and Barney’s past; there is a weighty sadness to this tale yet not an oppressive one as we see the Barton boys lose that childhood innocence to the accelerated maturity brought on by an abusive foster parent. Lemire and Perez do a wonderful job of contrasting the care-free days spent catching frogs with the awful reality that waits for them just inside their surrogate home in the person of a cruel, sadistic monster. In many ways this man is far more insidious than any villain the two would face as Avengers. These sequences are made even more poignant by Perez’s subtle approach in rendering them in watercolor washes of muted magenta, delicate violets and tranquil whites, every flashback at once soothing and startling due to the underlying tumultuousness that threatens to tear through the placid scenes of idyllic calm. This is likewise in contrast to colorist Ian Herring’s more vibrant and solid graphic style coloring of the present time events. The contrast does not stop there; just as the flashbacks are rendered and written with a more nuanced and poignant tonal quality, the present day events harken more to the Fraction/Aja Hawkeye, particularly visually. Perez captures many of Aja’s graphic sensibilities and hip visual storytelling beats; there are humorous self-defining sound effects, comedic moments in the heat of big action scenes and a dynamic stylized approach to character design that would fit right in in any issue of that run, even more so when you factor in Ian Herrings spot on color choices. Lemire’s narrative in these moments is kinetic in its energetic pace while maintaining a witty sense of humor, writing some extremely funny banter between Kate and Clint. 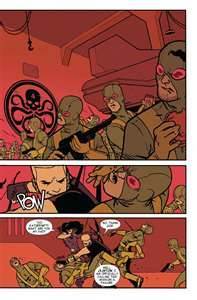 This entry was posted in all new hawkeye, Comic Book Reviews, comic books, Jeff Lemire, marvel comics, Ramon Perez, shawn warner and tagged all new hawkeye, comic book reviews, comic books, Jeff Lemire, marvel comics, Ramon Perez, shawn warner. Bookmark the permalink.